Natural silver, Anolok™ bronze, and Anolok™ ll blue-grey anodised finishes contain no organic elements. No colour fading is possible during the service life of these finishes. Organic powder coatings, on the other hand, are always subject to fading in varying degrees over the lifetime of a building. The technology of anodising has been established for almost 100 years. Whilst the process has been continuously refined, especially in terms of quality, the chemical and technological fundamentals remain unchanged. The on-site behaviour of the anodised surfaces produced today is fully predictable, based on the proven, long term, service experience. Independent inspection commissioned by United Anodisers has confirmed that the anodic protection remains undiminished after more than 40 years. The chemistry of organic coating is much more recent and, further, due to legal and environmental constraints, has been subject to continuing modifications. As a result, the long term, on-site behaviour of these modern coatings is not proven. Indeed, even some landmark buildings completed in the last 15 years with organic coatings are already showing signs of surface failure. The anodic layer is transparent and integrated in the surface of the metal; the natural metallic appearance and feel of the aluminium are fully preserved. The anodised finish will enhance and reinforce the natural beauty of aluminium to create a living surface constantly interacting with the natural or artificial light playing across its surface. Regardless of the substrate material - aluminium, steel, plastic - a painted surface always has the same, flat appearance. In trying to achieve the authentic metallic lustre of anodised aluminium, painted aluminium uses multi-layer systems with metallic pigments with the risk of creation of colour variations, including metameric failure. Even in its natural state, aluminium does not corrode in the same, destructive, way as iron or steel. On the contrary, its natural oxide layer provides a self defence against corrosion. Corrosion of aluminium, however, permanently damages the aspect of the metal. Anodising creates a perfectly formed and scientifically controlled oxide layer, which ensures a surface of unparalleled corrosion resistance and locks in the pure and natural metallic aspect of the metal. 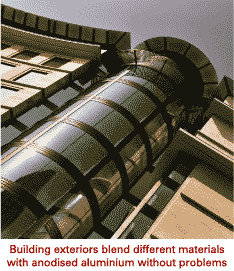 It has been used for external building applications for over 60 years. With an appropriate anodic layer thickness for external use, anodised aluminium will perform without problem, even in the most severe environments. In particular, anodised finishes are highly durable in city and marine environments, due to their resistance to chlorides and sulphates. 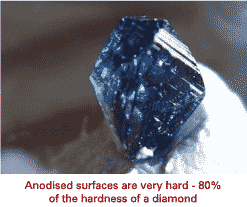 Aluminium oxide is a very hard compound, which is second only to diamond, on the Mohs scale of mineral hardness. Anodised aluminium surfaces therefore offer superior scratch and abrasion resistance than coated surfaces. Anodising is an electrolytic process, which transforms the surface of the metal into an oxide layer integral with the metal itself. It is not a coating applied to the surface of the metal. 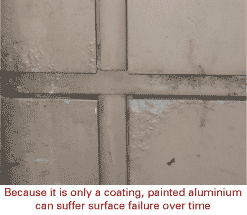 There is, therefore, no risk of adhesion failure such as peeling, blistering, cracking, splitting or chipping which may occur with surface coatings, such as painting. There will be no adhesion failure, even on cut edges or joints. Natural silver, Anolok™ bronze, and Anolok™ ll blue-grey anodised finishes contain no organic elements. No colour fading is possible during the service life of these finishes. Organic powder coatings are always subject to fading in varying degrees over the lifetime of a building. Chalking is the formation of a fine powder on the surface of the paint film during weathering. It can cause significant deterioration in surface appearance, with a reduction in the gloss level, surface lustre and colour. Anodised aluminium does not suffer from this disfiguring condition, even when exposed to difficult exterior environmental conditions, such as marine locations or very sunny and/or humid climates. 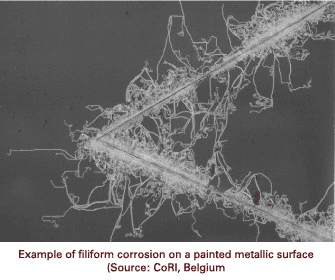 Filiform corrosion is an attack on the hidden inter-layer between the aluminium and the surface finish which results in the propagation of corrosion under the surface finish. With anodising, the oxide (anodic) layer is integral with the aluminium. There is no inter-layer between the metal and this protective oxide layer. As a result, the finish will remain free from filiform corrosion. If the surface is punctured or damaged, the aluminium will simply repair itself through natural oxidation. The absence of an inter-layer zone ensures that there can be no corrosion as found with painted products. Anodising is a process which can be carried out prior to or after the transformation of the metal. Since it is an immersion process rather than an applied finish, anodising provides a particularly uniform and regular finish on most metal shapes and textured surfaces such as perforated sheets, tread plates, linished or brushed metal, mesh material, stucco surfaces, etc. Anodising avoids the risk of localised high coating thickness or orange peel effect, typically associated with organic coatings on such surfaces. Anodising, as an immersion process, achieves a more uniform surface coverage, especially for extruded sections. With spray paint processes and, especially with powder-coating, the non-visible surface is often not coated. A properly sealed anodic layer is impermeable. Furthermore, when severe environmental temperature fluctuations occur, the anodic layer is not subject to damaging physical changes and consequential embrittlement. With an organic coating, these changes may occur when the coating is subjected to temperature cycles above and below its glass transition temperature. The tightly controlled quality assurance in the anodising process can be followed up on site without damage to the anodised surface. One of the key advantages of aluminium over other materials is that it is can be recycled repeatedly through simple re-melting with minimal loss on each cycle. In Europe, more than 30% of aluminium consumption is satisfied with recycled aluminium and over 90% of the aluminium used in buildings is recycled at the end of the building's life. The recycling process requires only 5% of the energy required for the production of primary aluminium - a significant contribution to environmental sustainability. 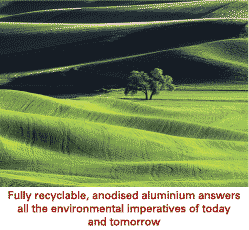 Anodised aluminium is unique, comprising only pure aluminium, its alloying elements and oxygen. As pure aluminium, it is fully recyclable without intervening chemical processes and emissions. Because of this and the ready market for quality aluminium scrap, the anodised aluminium will have a cash value to offset the cost of demolition at the end of the useful life of the building. Modern architectural anodising plants are capable of responding to the most stringent environmental standards with full chemical recycling and a large recovery of waste water. Anodising does not require environmentally sensitive pre-treatment like chromating. The anodising process does not produce CO2 or solvent emissions. Guarantees are often considered by specifiers or building owners to provide reassurance about the long-term performance of a surface finish. In recent years, there has been a trend of extending guarantees for longer and longer periods as a way of outbidding competing surface finishes. But, guarantees have often been full of exclusions and reservations. Invoking guarantees, often years after the event, frequently involves costly litigation. Further, even if the guarantee is successfully invoked, replacement of defective parts may be impossible without partial demolition of the building. Where this is not practical, the owner of the building will be simply left with the problem over the long term; legal recourse for aesthetic damage is notoriously difficult to assess. Surface failure may render a building impossible to sell or otherwise seriously blight its open market value. Historically, quality claims against leading architectural anodisers have been negligible. In the highly unlikely event of a claim, the anodiser alone bears full responsibility for all properties of the anodic layer. As a result of recent independent surveys of long term on-site performance of anodising - including in polluted and marine environments - a simple, straightforward, unequivocal design life guarantee, typically for at least 25 years, for anodising is available for the first time, exclusively from United Anodisers. Please contact us at the start of the project to discuss your particular project specifications and any warranty required. Guarantees for organic coatings are not backed by the same site exposure history. For any organic coating, the responsibility for any failure is necessarily divided between the paint manufacturer and the paint applicator. The guarantees available from the manufacturers of polyester powder specifically exclude adhesion. Guarantees are important, but only if they are simple, straightforward and long term - this is only possible when they can be given backed with the full confidence of proven, long-term, on-site performance. Powder coating is being used on many major building projects as it is cheaper and thought to be the equivalent of architectural anodising. Powder coating is softer, less durable, and unless done perfectly can peel. Neither can it exhibit the natural metallic lustre of anodising. Softer - Architectural anodising by UA is harder than glass which means it is less prone to damage, wear and tear and can be, if neglected, abrasively cleaned to restore it to its original lustre. PPC is soft, prone to scratching and cannot be abrasively cleaned. Less durable - Anolok™ anodising by UA is fade free and is offered with a lifetime guarantee. All organic coatings in time lose gloss and colour. Anodising has been used in architecture for more than 80 years; PPC was introduced in the late 1970’s, much less than 40 years ago. Anodising is a process where the coating is grown on the surface of the aluminium and cannot ever peel off. PPC is an applied paint that can peel in service. If you want peace of mind and a building exterior that will really last, anodising is the only choice.